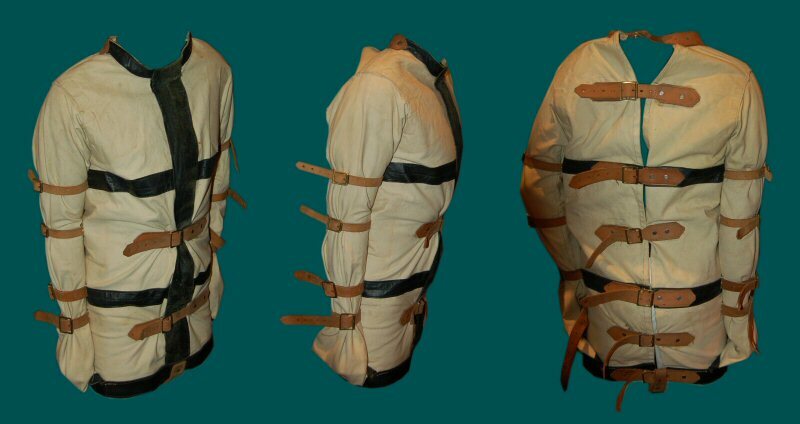 In 2006 Jim Stewart was moving and had a eBay liquidation of his own stuff including several truly great straitjackets from his collection. I was lucky enough to purchase his original John Bull Challenge Straitjacket prototype. 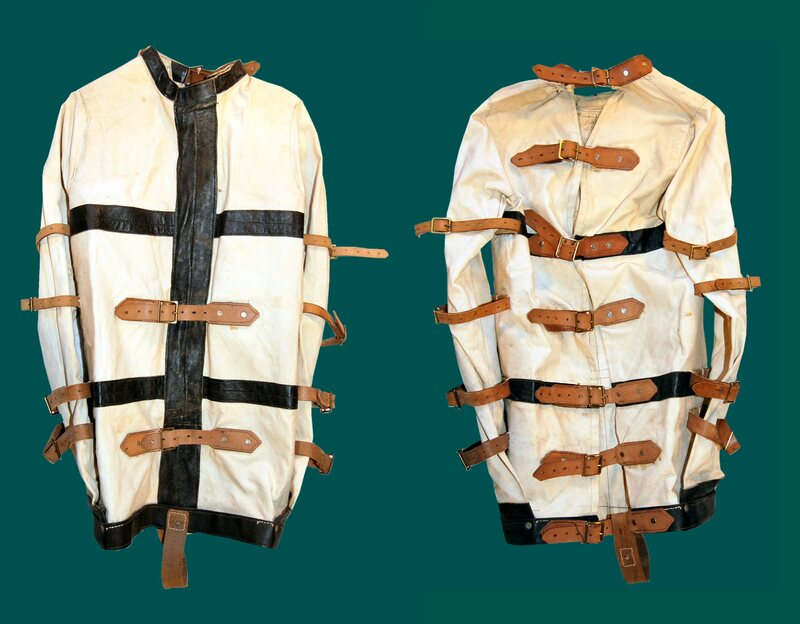 This straitjacket was a copy of a jacket designed by Val Walker as a challenge to Houdini. Stewart's own description of the jacket can be found on his own web site and is quoted below. The following text comes directly from Jim Stewarts own web page on the John Bull Challenge Straitjacket. "HISTORY:The original jacket used to challenge HOUDINI no longer exists. Immediately after the designer, British Escape Artist VAL WALKER challenged HOUDINI at the Kingstone Emprise in September 1926, the American showman is reported to have cut the jacket to pieces and tossed the shreds to the cheering crowd - which seems to suggest that Houdini had cut his way out and then destroyed the evidence. By the time I talked to Kevin, son of the original challenger VAL WALKER in the nineteen seventies, the jacket he showed me was a copy in very poor condition. A photo in the magazine of the British Magic Circle 'The Magic Circular', May/June issue 1968. (For photo of Val Walker in his jacket see end of this page) was less than impressive - but the design principle was excellent. Technical specifications as given to me at the time were quite detailed - but there remained little proof of how the original jacket looked. The photos [...see above...] show the first copy I made in the early Eighties using high quality government surplus leather straps and buckles and new heavyweight rip-proof canvas. This garment gave me opportunity to explore the physical possibilities of the original. Efficiently applied, the jacket allows virtually no movement of the upper body. Hands are trapped inside closed sleeve-ends which are attached to the hem of the jacket. The through-crotch strap is adjustable to give maximum rigidity. This is indeed a great jacket, one of the most interesting items in my collection. It is very secure and truly unique.